The next piece in our 2010 Best of Blog was our first post ever picked up by the website Planetizen. Parking, especially in a downtown, is such a race-to-the-bottom that it has become almost impossible to address the damage in many places. Add parking and you lose urbanism. Lose urbanism and you become more reliant on people driving to and parking at your destination. This creates even more demand for parking. The more parking you add, the more you need until your downtown has the density (and the ambiance) of a WalMart parking lot. This piece was an attempt to break the downward spiral and help communities at least begin to understand that there are ways to do parking better so it does not totally destroy your town (and may give your place a chance once you adopt a Strong Towns approach). The subtle importance of branding. I always start the presentation by explaining that Celebration, like any small town, is made up of the same components. They all have streets, buildings, sidewalks, parking, cars, people, lights, etc... It is just that in Celebration they are assembled differently. So the provocative question we try and get people to ponder is simply: how do they want to assemble the parts they have to work with. Oh, and we also point out that, unlike nearly every other small town, Celebration is both high density (by small town standards) and desirable to live in. So Celebration makes efficient use of their infrastructure and uses the urban form of the community to increase property values within. For small towns that are devolving under auto-oriented zoning codes while also financially struggling to maintain their underutilized infrastructure, Celebration presents a radical alternative. Nowhere is this more evident than in the location of parking. Here is a picture of the main commercial area of Celebration. We have used red to identify the parking areas and blue to highlight the road corridors. 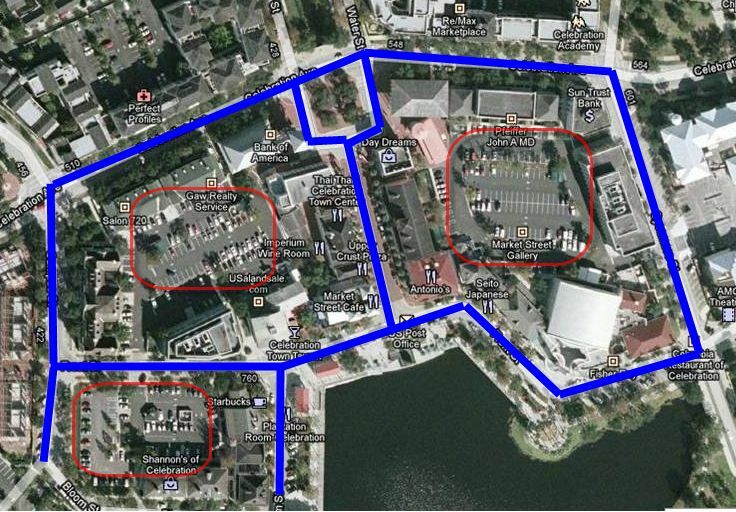 Notice how very little of the parking areas abut the streets. It is all internal to the structures, which are assembled along the street corridors. Not only does this configuration create a vibrant public realm, it correctly allocates the highest and best use to the most valuable real estate. Parking lots do not sell goods, employ people or pay much in property tax. Businesses do. In Celebration they understand this and make sure their commercial endeavors get top billing. Now contrast that with an image of my home town of Brainerd, MN. 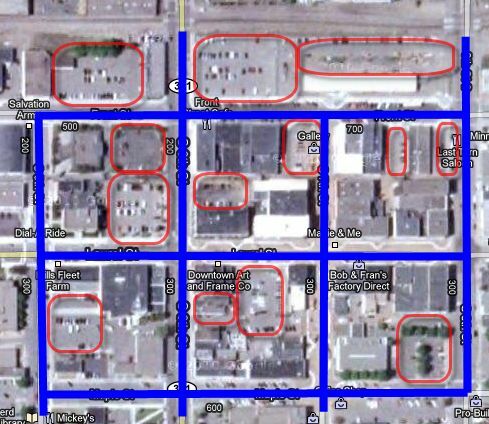 We used the same designations for parking and street location and in doing so the differences are evident. Brainerd has about the same amount of parking as Celebration, but it occupies prominent, valuable real estate. In fact, one of the two most important intersections in the city - the intersection of Laurel and South 6th - is 1/4 parking. (Unfortunately another 1/4 of this intersection is a brick wall building that looks like a jail. The other half of the intersection is one of the best coffee shops around and a retail location with revolving tenancy). Not only does all this parking underutilize the infrastructure, generate relatively nothing in tax revenue, employ no people and occupy some of the best real estate in the city, but it also detracts from the public realm. Brainerd just sunk millions into making their downtown more pedestrian friendly, but without addressing all of the sense-of-place-destroying gaps created by surface parking, the downtown is still struggling to create that sense of vibrancy. In short, Brainerd is obtaining a very low return on investment. Celebration, by assembling the same components in a different way, is realizing a high return on investment. Communities wanting to be Strong Towns would do well to understand the lessons of Celebration and adopt a development pattern that makes better use of their infrastructure investments.